Certification On successful completion of the course, all participants will be given a nationally recognised Statement of Attainment, valid for 1 year. Fees Varying, depending on the course chosen and group size, contact us for a quote. Group discounts applicable. At Training Australia, we are delighted to now provide our clients with Group First Aid Training Courses. 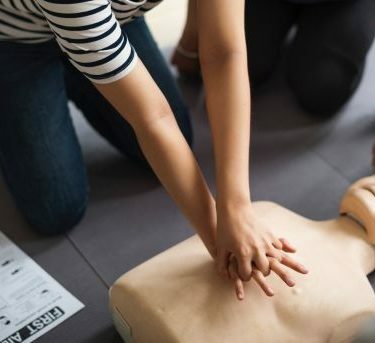 Whole families, schools, colleges, companies, social clubs, etc., can make use of this opportunity to learn first-aid training together and at a cheaper rate than our other courses. Group Discounts – We provide special discounts on group bookings, thus effectively making the course cheaper for all the participants. Scheduling Flexibility – If you are booking a Group First Aid Training Course with us, we can schedule the course delivery at a time and venue that is suitable for all your group’s members. Customised Programme – The course content can be customised as per the needs of the members. For example, if the participants are regular seafarers, then during the training session a focus can be maintained on administering first aid in seaborne accidents. Relaxed Environment – In a group first aid training course, all the participants are likely to know each other. This encourages them to indulge in open communication with the trainer and other participants during the session. Group First Aid Training – Why Us? We are a nationally recognised Registered Training Organisation (RTO 40990) and all our courses are nationally accredited. Simulations are a key component of our training sessions, as we understand that teaching the course only through slideshow presentations can be really boring for the participants. As part of our OH&S regulation fulfillment, we decided to get our staff trained in administering first aid in emergency situations. A friend of mine who supplies first aid kits, connected us with Chris at Training Australia. Chris walked us through the whole plan and structure of the Group First Aid Training Course (HLTAID003), and was clear that his method of course delivery was focused more on practical simulations. He offered us a huge discount, and we kicked off the sessions by starting with our Admin Department. At the end of the session, several of the employees said that they were feeling quite confident to deal with real medical emergencies in the future. They were happy that the company had invested in their welfare by providing such useful training. Held over a period of one week at our own office premises, Training Australia’s Group First Aid Training Courses turned out to be a huge success, and a clear win-win for all. My family and I had already got our boat licenses from Training Australia. And then, when Christopher told us about how First Aid Training Courses could also be helpful to us, we decided to enroll for that as well. I brought in 4 more trainees, and Chris gave us a pretty decent group discount. The icing on the cake was, that we all learnt an incredible number of practical ways to deal with medical emergencies, and Chris made them fun to learn. So, overall I can say that Training Australia’s Group First Aid Training Courses are truly budget-friendly, educative and enjoyable.